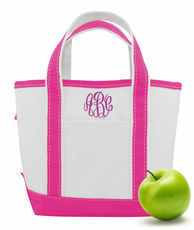 The Handy Open Top Tote is the cutest little tote bag around. This bag makes for the most charming small accessory whether you're giving it away as a gift or keeping it all to yourself. The Handy.. 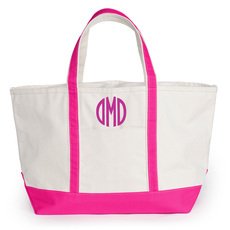 Most commonly used as a beach bag, this personalized medium boat tote is the perfect size for when you need to carry a lot of things but don't want to be weighed down. 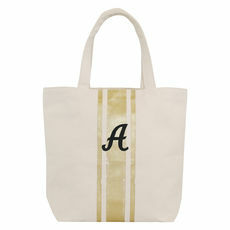 Tote features a shimmering.. 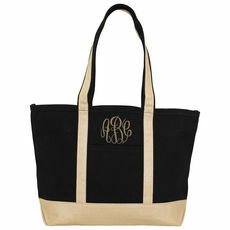 This stylish tote is perfect to hold your everyday essentials. Made of a smooth brushed canvas complete with top zip closure and outer pocket. 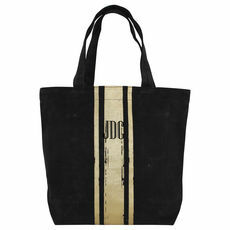 Tote size is 12" H x 18" W x 5.5" D with.. Spacious and convenient, our Carry All Tote is ready to handle any job. 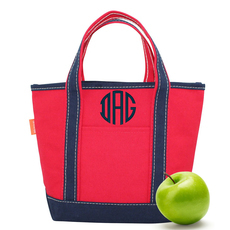 This canvas tote has 10.5" handles, 6 roomy outside pockets, 1 inside organizer pocket. 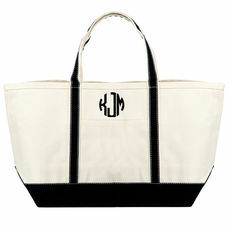 Dimensions of tote: 14" H x..
Great canvas tote ready to hold everything! Tote has a zip closure and one front pocket. 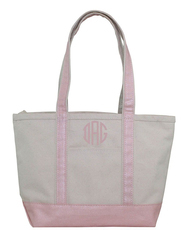 Dimensions of tote: 14" x 25" x 9" with 18" strap drop. Embroidered in your choice of.. 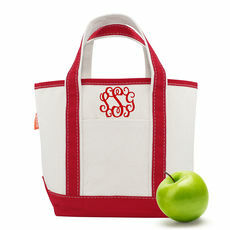 Spacious and convenient, our Shopper Tote is ready to handle any job. 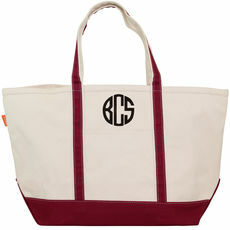 This canvas tote has 13" leather handles, a reinforced bottom and two inner side pockets. Dimensions of tote: 14" H x..
Our canvas round duffel bag with leather handles is great to travel with. 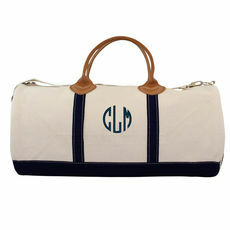 Duffel has a zip closure, 2 inner pockets, 15" leather handles and a shoulder strap. 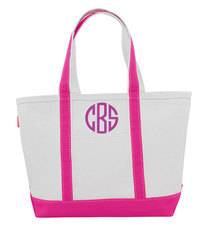 Dimensions 10.5" H x..
Great canvas tote ready to hold everything! Tote has a zip closure and one front pocket. 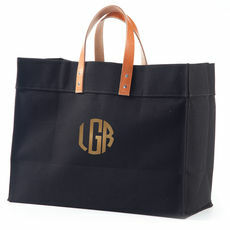 Dimensions of tote: 12" H x 18" W x 5.5" D with 18" canvas handle. 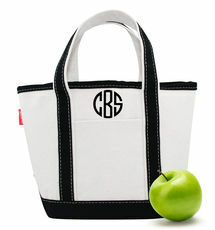 Embroidered in your..
Great canvas tote ready to hold everything! Tote has a zip closure and one front pocket. 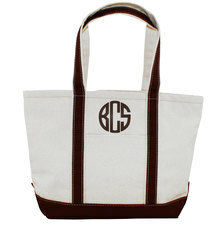 Dimensions of tote: 14" H x 25" W x 9" D with 18" canvas handle with a 9" handle.. 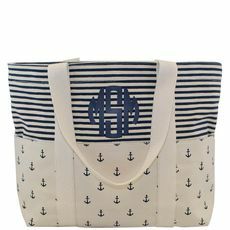 Most commonly used as a beach bag, this personalized medium boat tote is the perfect size for when you need to carry a lot of things but don't want to be weighed down. Tote features a glistening.. 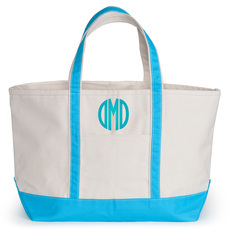 This stylish tote perfect to hold your everyday essentials. 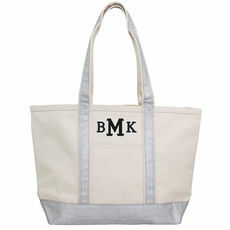 A soft, smooth brushed canvas tote bag crafted in the ideal shape and size for everyday use. Open top no closure. Brushed Canvas with.. 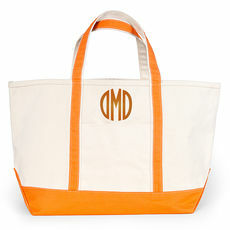 This stylish tote perfect to hold your everyday essentials. 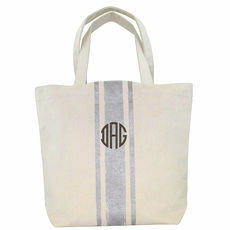 A soft, smooth brushed canvas tote bag crafted in the ideal shape and size for everyday use. Open Top/No Closure. Brushed Canvas..
Our most popular and biggest bag. 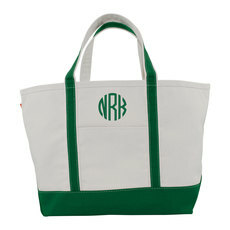 Size of tote is 14.5" H x 25" W x 9" D with canvas handles that have a 5" handle drop. 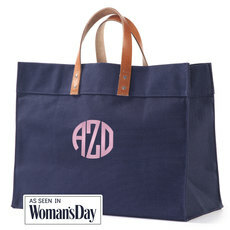 Embroidered in your choice of personalization style and..
Great canvas tote ready to hold everything! 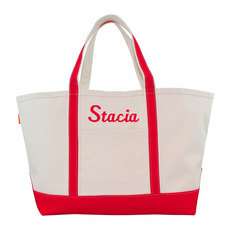 Tote has a zip closure and one front pocket. 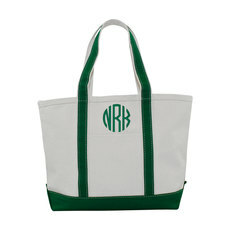 Dimensions of tote: 12" x 18" x 5.5" with 18" canvas strap. Embroidered in your choice of..